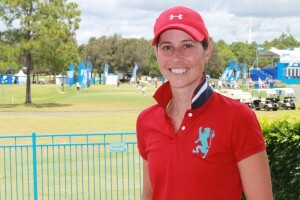 AUSTRALIAN professional Rachel L Bailey has put the demons of a debilitating health problem behind her as she prepares for an assault on the Ladies European Tour (LET). For the past three years Bailey, who turned pro in 2003 and played the US Futures Tour, has worked hard on and off the golf course to regain strength and her form. At one point in her career she even contemplated quitting the game. “At the end of 2006 I wasn’t feeling very well because of a thyroid issue that was causing me to shake and lose weight,” she said. “I lost 10 kilos and got down to 50 kilos at one stage. I couldn’t sleep and golf wasn’t going well. “So I decided to have it destroyed, which now means I will be on medication for the rest of my life. “It took 18 months for me to start feeling normal again and about three years to regain my strength. Bailey, the daughter of two maths teachers, grew up in NSW’s Blue Mountains and attended New Mexico State University in the USA. “I really enjoyed it at New Mexico, but going there was a bit of a culture shock,” Bailey said. She played collegiate golf, had one victory and nine top-10 finishes. For Bailey, it was a tough transition going from successful amateur to eking out a living on the pro circuit. “My career started very slow because I didn’t have a role model, mentor or anyone to help me through the process so I pretty much learnt everything on my own,” Bailey said. “It didn’t really start to pick up until 2007 and then it dropped off because of my health problem. “But 2009 was a steady year and 2010 was better. The 30-year-old will now spend the year under the watchful eye of her coach Glenn Whittle. Whittle said Bailey was a determined and talented golfer who was prepared to put in the hard work to be successful. Bailey and Whittle are hoping for good start to the LET season. “It would be great if she could finish in the top-20 on the money list and I believe that’s possible,” Whittle said. Bailey said she was prepared to put in the hard yards to achieve her goals. Bailey says one her career highlights was appearing on the US’s Big Break reality television show. “I was on the sixth Trump National series, which was hosted by Donald Trump,” she said. “There was two weeks of filming and the show aired for 12 weeks. Bailey, who won one of the challenges and collected a $4000 bonus, made it through to the penultimate show before bowing out. She lists her hobbies as reading, going to the gym, movies and board games. “Board games are fun, but I’ll tell you the board game I hate – Monopoly,” she said. “Don’t ever ask me to play Monopoly because the board will go flying. “I like Bananagrams, which is a new game similar to Scrabble but you don’t keep score. I ask her why she goes by the moniker Rachel L Bailey and what her middle name is. My favourite club in the bag is … seven-iron. The strength of my game is … persistence – I just never give up. A tournament I’d like to win is … any tournament. My best ever score is …66. My favourite golfer is … I don’t really have a favourite. Favourite golf tournament to watch? The US Open. The best thing about golf is … It teaches you patience and it teaches you to let go of everything that is not important. The worst thing about golf is … The fact that you can easily get frustrated. Another sport I’d like to be good at is … tennis. Superstitions? When I mark my ball on the green it has to be tails up. Dream fourball? Homer Simpson, Camilo Villegas and dad. Favourite junk food? Cheese burgers. My favourite television show is … How I Met Your Mother. Favourite music? All kinds – I am really into Glee right now. As a child I wanted to be a …a singer. I am a good car singer on my own.